With that number of people you can expect very crowded display halls and at some stands like Nissan, it was continually packed out. The crowd was some 30 deep by my reckoning. Why Nissan? because they showed the production new 'Skyline' GT-R of course! Thankfully not all the stands where like that. There where a lots of other activities you can try or see. They where demo trail bike, Playstation3 Grand Tourismo 5 Prologue racing with other visitors, the police motorkhana demos which you can check out a video of, on the pictures site, but you have to really see it in real life to see how skilled and scary these riders truly are, slot car racing track and the list goes on... Needless to say I didn't spend too much time in some of the stands. Of the actual demos which you or your children can be part of included the 4x4 adventure test ride, Safety experience test ride, Clean energy test ride, commercial vehicle test ride and the kids motorcycle school. As you can see from the picture I included at the top of the page the 4x4 adventure ride was by far the most popular! I'm sure you can guess why. I wasn't interested in that considering my adventures over the years (again see the pictures site for some of my cool pics). Although the show had many models on display they didn't have the manufacturer's complete model range. To view them you'll need to find a local dealer to check out the domestic car models. Yes, it is worth trying to find a local dealership. Note that Toyota has a huge display center called the Mega Web in the Odaiba precinct where every model they sell is on display. They also have a few older models you can check out! This area is worth a visit regardless as there are tons of things to things to see including various land mark buildings. 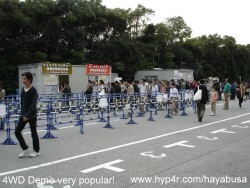 The show was fantastic for foreign visitors as the Japanese are really good at being civil in a busy area! No other place in the world is like it. I checked out buses, trucks, all sorts of cars and of course motorcycles. Furthermore they never ran out of brochures for you to collect. I ended up with at least 5 kg of material. Most of them are in Japanese but numbers and pictures speak for them selves. I will post scans and pictures over time. Although the event was a great experience I have one criticism. The merchandise stores where very few in number and they didn't have many things to choose from. T-shirts weren't big enough for me and I didn't need any more key rings. In fact there where more food stalls than merchandise. So please - more goodies so visitors can buy them. Limited edition items would be really good too like the Zippo which they ran out off! Many have come a long way to visit. So all in all worth a visit. As a side note, as I've asked the locals does not have a central car or motorcycle district where they all set up shop. Likewise Japan does not have central motorcycle district. I've seen comments on the web that Ueno is the motorcycle district. I can tell you that there some small workshops and dealers there but nothing extensive. The main area is basically one particular store called Corin spread out into various buildings. The stuff they sold is Ok but could do better. I could not find any of the familiar European brands or American except for Harley Davidson - of course. Overall the store covers less than 25 meters square. My advise is to visit the suburbs for the stores by checking out the phone directory if you can find one. See later pages on my other adventures and where to go if you want car or motorcycle parts and the actual factories. So hundreds of pictures later and a ton of new automotive related material I was pleasantly tired and anxious to read the brochures in detail.